This entry was posted in Recovery & Support, Substance Abuse and tagged Alcohol Abuse and Addiction, Co-Occurring Disorder, Prescription Medication, Signs and Symptoms on July 29, 2016 by Baxter Ekern. Contributed by Roseann Rook, CADC, Clinical Addictions Specialist at Timberline Knolls. Today, it is rare for an individual to enter treatment with only a singular diagnosis. Most have co-occurring disorders, in which the primary diagnosis could be anxiety, and the secondary diagnosis could be a substance use disorder. It is equally likely that a person could have a primary diagnosis of alcoholism along with a secondary issue with depression. The question of, “Which one came first and did the first cause the second?” is often bandied about in the treatment field. Even for individual patients, the answer is not often clear. The various disorders and addictions intertwine and overlap, not unlike the various members in a highly enmeshed family. 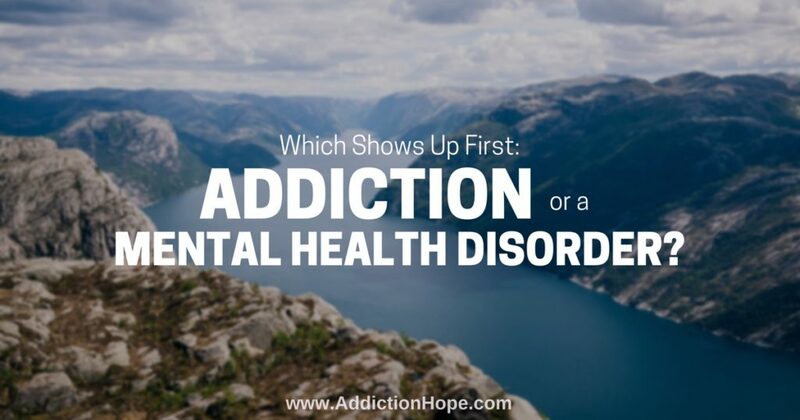 The truth is when it comes to whether addiction or a mental disorder came first, it can go either way. Alcoholism Or Depression: Which Shows Up First? Alcohol consumption is a good example of when addiction and mental disorders collide. Although alcohol is often paired with the concept of revelry, partying and positive group behavior, the bottom line is alcohol is a depressant. Hence, alcohol can lead to depression. Or, on the other hand, a person may be clinically depressed and turn to alcohol, hoping it will deliver on the “party” promise. It won’t. In fact, many believe that the escalating rate of suicide among college students is connected to alcohol abuse. It is easy to imagine a stressed and depressed student turning to alcohol to feel better. Once intoxicated, even more depressed, and now struggling with impaired judgment, that student can easily go from “maybe” to “yes” regarding self-termination. If an person is addicted to any type of drug for a prolonged period of time, behavioral changes will certainly occur, such as displaying poor judgment or dealing with impaired decision-making skills. In recovery, those alterations will dissipate as the individual returns to normal functioning. Of greater concern are the negative physical changes that transpire in the brain, which are often permanent. Marijuana, though legal in several states, is both psychologically and physiologically addictive. This is due to the high potency of the marijuana grown throughout the world today. Although this drug does not cause psychosis, it can trigger psychotic episodes. Paranoia is also a common symptom associated with using marijuana, usually after prolonged use. Withdrawal from this drug causes extreme anxiety, both physically and psychologically. Not only has the individual numbed out for a long period of time, but he or she has not developed solid coping skills. Therefore, when he or she must exist in the real world with all its pressures and stressors without marijuana, it can look as if the person has a true anxiety disorder. With a drug such as cocaine, each time a person “comes down,” they fall deeper and harder. They “must” have the drug to alleviate the terrible consequences of withdrawal. If the drug is not available, they typically turn to alcohol or marijuana. If this person goes to a psychiatrist or medical doctor and does not tell that professional of their cocaine use, the physician could easily mistake the symptoms as signs of bipolarism. Of course, the greatest drug problem in the United States today is prescription abuse, primarily opiates. Most future addicts start taking opiates for a legitimate medical reason. In addition to alleviating real pain, opiates deliver a profound sense of well-being. If the prescription user had been dealing with any depression or anxiety, that is also now gone. Often people ask for prescription refills due to pain, which could be real. On a biological level, the human brain wants what it wants. The brain quickly connects a positive feeling with the drug. To get the drug, there must be pain. Therefore, the brain creates pain to get the pill. Unfortunately, the brain, along with the rest of the body, ultimately loses because addiction will result. Interestingly, opiate users rarely acknowledge being addicted. Instead, they cling to an idea that they are just “not getting better,” which is why they need more of the drug. It is very important for those around them to know that it is not the user’s fault. The worst component of this non-culpability is that they will not get the help they need. Conversely, addiction can result from a true psychological disorder. An individual could struggle with depression or anxiety, which can cause severe distress. So, these people self-medicate. The woman with depression takes benzos to elevate her mood. The college student with anxiety buys Xanax over the internet. Even if these individuals sometimes use these drugs recreationally to get high, it is not something that they will often acknowledge. Self-medicating just sounds more legitimate. They are not abusing drugs. Rather, they are “self-medicating” in order to function. The problem remains, yet addiction will result. Post-traumatic stress disorder (PTSD), can, and does, lead to a great deal of addiction. In fact, the vast majority of those with a substance use disorder have experienced trauma in their lifetimes. In severe PTSD cases, the individual can experience terrifying flashbacks and nightmares. They can live in a constant state of agitation and dread. Every waking minute can prove hellish. It is really no wonder that these people often turn to alcohol, or any kind of drug, to provide relief. In terms of disorders and addictions and which one presented itself first, the answer is often not that important. What is critical, though, pertains to treatment. Disorders and addictions must be treated simultaneously. Anything less than that should be considered inadequate treatment. What are your thoughts on co-occurring disorders and which disorder occurs first? Share your opinions or observations in the comment section below.